Without users for the platforms we build, even the most groundbreaking applications can quickly turn into shelfware. Humans, of course, can be unpredictable and demanding but—love or hate them—they’re the reason we build platforms in the first place. When building and operating software, always ask yourself this essential question: Which matters most, your internal or external client? In general, tooling is seen as internal, while public-facing items (UX) are external. With the rise of DevOps and site reliability engineering, these lines can blur as rapid and agile changes become the norm. Since many business users have grown up with the beauty and simplicity of Apple design, they expect consumer-level interaction with enterprise applications. This movement is called Frictionless IT. But from the operations and DevOps view, the Apple ecosystem can seem a bit challenging because it’s so geared towards the external client. MacStadium helps close this gap by providing a cloud geared toward iOS/Mac workloads. iOS/Mac workloads are an important part of an organization’s development infrastructure. Rarely, though, are these particular workloads contained in a vacuum. There can be multiple boundaries and applications that a customer crisscrosses during the user journey. Workloads placed on MacStadium are crucial to reaching the end user. Backend systems that flow data through the organization might be on other platforms such as Linux or Windows, however, making it challenging to get an unobstructed, 360-degree view of the user journey. Application Performance Management or APM, is the monitoring and management of application performance. For example, an iOS application that is used to purchase a movie ticket could move through several endpoints, back-end systems, and databases to get the job done. An APM solution can help trace each step of the user journey to make sure user sentiment and service-level agreements (SLAs) are being met and proactively alert around changes in such. APM solutions are not only limited to production; any environment can benefit from the insights that an APM solution provides, giving direct feedback into the development pipeline. AppDynamics, an APM solution, can trace the entire user journey, such as the purchase of a movie ticket. Shown is a flow map initiating at the front-end weaving through each tier of the application stack for the full user journey to purchase a movie ticket. By providing scalable Mac infrastructure, MacStadium is helping to usher in the next generation of iOS/Mac workloads. Of course, apps rarely exist in a vacuum; rather, they rely on workloads spanning multiple platforms running Linux and/or Windows for critical functions. When it comes to optimizing the customer experience, an application performance management solution is as important as a good product-market fit, a healthy continuous integration workflow, and talented developers. AppDynamics has been providing iOS ecosystem support for several years via Mobile APM, which is part of a larger suite for monitoring customer experience across workloads. APM now has the ability to tie business outcomes to application changes and performance, allowing teams to close the feedback loop even tighter. 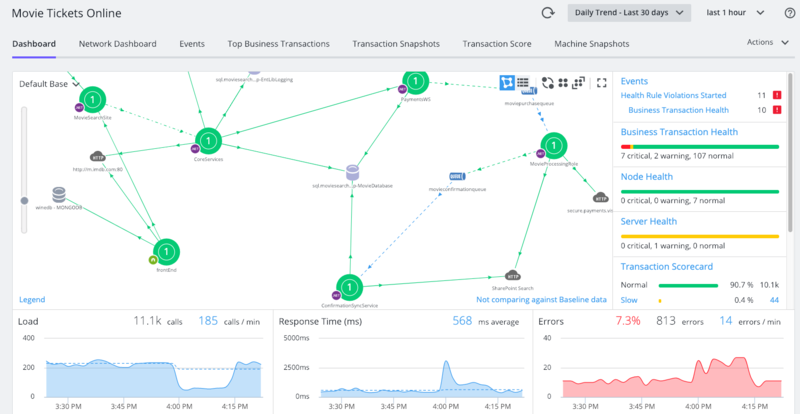 Looking towards the future, AppDynamics is harnessing the power of AIOps, incorporating the power of artificial intelligence in operations, to allow for more autonomous capabilities such as self-healing. Feel free to take a look at the AppDynamics solution in detail. Coupled with the power of a MacStadium cloud, AppDynamics can ensure a smooth user journey across multiple devices and disparate infrastructure. This guest blog post was written by Ravi Lachhman, Technical Evangelist at AppDynamics. Ravi is an evangelist at AppDynamics focusing on the cloud and DevOps spaces. Prior to AppDynamics, Ravi spent time at Mesosphere, Red Hat, and IBM helping enterprises and the federal sector design the next generation of distributed platforms. When not helping to further the technology communities, Ravi enjoys traveling the world, especially with his stomach.